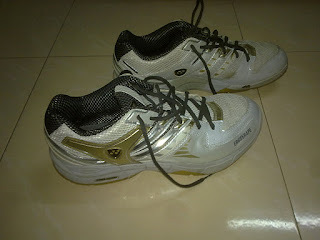 SHB-SC5EX is the Yonex shoes I bought after a lot of research on their 2011 catalogue. I wanted to buy White and Red SHB-92MX, but was not available. Overall SHB-SC5EX is fine. It has 3 layer Power Cushion around heel as well as in front area. One problem I faced was that wearing a socks which has thick lower layer can lead to ankle twist since the shoe as such is high. I was able to get thin sports socks from Nike which is suitable when using this shoes. With my earlier shoes (which was a Reebok), I used to feel pain in front portion of my feet while playing, with this Yonex shoes I don't feel that pain at all.